There has been a lot of talk in recent weeks about using guest blogging as a tactic in SEO. 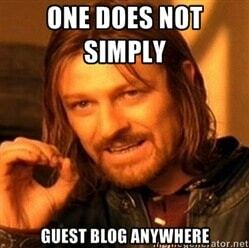 I’m sure many of you will have read Matt Cutts’ blog post on how guest blogging is now dead. This has sparked a lot of debate throughout the internet about where we stand with guest blogging. This is a question lots of people have been asking. This all depends on what you think guest blogging is, how you are using it and what you are trying to gain from it. As Matt Cutts highlighted, guest blogging has become a popular way to build spammy links and this has given guest blogging the image of being a low quality and easy way to build links. This is what guest blogging has become to a lot of people, an easy way to buy or sell links which is why it could be a good thing that it is dead. If guest blogging is the only way that you have been building your links then you will have a problem, even more so if you have been accepting John’s offer! With Google algorithms effecting many websites with shady backlinks, by continuing with low quality guest blogging you are only going to harm your site. One consequence may be that you will have to spend just as long disavowing the links you have just built. However, this doesn’t mean that guest blogging it totally dead. In his blog, Matt Cutts spoke mainly about low quality content and paying for links. There is still value in building relationships between your site and other relevant and high quality websites. How can we use guest blogging? It is important to ask yourself why you are using guest posting before you jump in. If it is to get as many links as you can then you might as well give up now as you will only be making more work for yourself. We should be using guest blogging to build up brand awareness, share quality content and to build relationships, not links like I spoke about in my last blog post. Remember, content is king, not something to throw about for cheap (or expensive) links. What does this mean for guest blogging? Hopefully this will be good for guest blogging. We can hope that this will discourage spammers and encourage quality and relevant content, which ultimately should be what guest blogging is about anyway. If you are looking to build links in this way then you will need to rethink your strategy. What do you think about guest blogging? Do you think it’s dead?